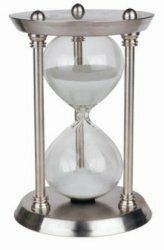 The Stainless Steel Half Hourglass is a contemporary twist on the traditional hourglass. This model measures 30 minutes with the use of sand. Ideal as a novelty gift for even the most modern of houses.